RootsTech is a party for genealogists. It’s going to be at the Salt Palace Convention Center in Salt Lake City, February 8-11, 2017, and it has more than 200 breakout sessions for all levels of experience so that the biggest challenge most of us face is deciding which to attend. The Expo Hall is jammed with exhibitors showing off the newest and best gadgets, gizmos and systems we can use to advance our family histories. The Innovator Showdown, for which The Legal Genealogist was a judge this year, gives up-and-comers in the field a shot at prize money to bring their ideas to market. It really is a don’t-miss party for genealogists. And then there’s the party after the party. Last year for the first time MyHeritage threw a party after the party as RootsTech came to a close. It was by invitation only and there were a lot of people disappointed when they didn’t get an invitation to go. MyHeritage is doing it again this year, hosting the MyHeritageDNA RootsTech After-Party to highlight its new DNA testing and give everyone a chance to let their hair down. And, this year, five of this blog’s readers (and their guests) will get to attend. Who’s sponsoring the MyHeritageDNA RootsTech After-Party? I am sure it is Elmer Fudd. There is more to him than meets the eye. But darn, I can’t get to Salt Lake City this year… unless I can be certain the Queen will be there. But have fun anyway. Go MyHeritageDNA. Right on. From now until 2 weeks after roots tech is over there will be no blogs covering every day stuff. I won’t be at roots tech. I’m subscribed to several blogs. There’ll be nothing for me to read for over a month. Maybe I’ll get something done around here! On second thought, I guess you don’t need to be a genealogist when you are the person that really CAN just pull a book off the shelf and find your complete tree in it, already done as far as extant documents (all of which are properly cited) permit, with all assertions vetted by experts. Well, my first thought was Elmer Fudd. I imagine he is very interested in making sure the Bunny surname is nowhere in his family tree. 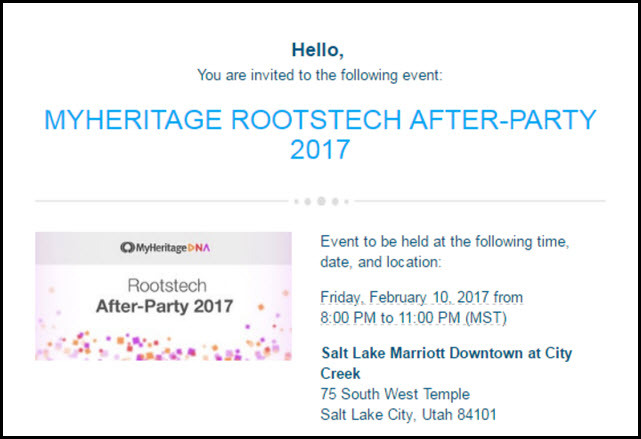 But, I’m going to go with MyHeritageDNA as the sponsor of the MyHeritageDNA RootsTech After-Party. Final answer! Noted, but make sure you enter the way the blog post asks so that your email is verified — winners will be notified by email. I would love to attend. But I would really like for my husband Erik to go more. Why? Because I love him. ANd its his first Genealogy Conference. So the answer is B.MyHeritageDNA.